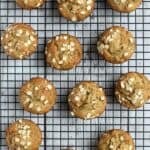 Tender, crumbly Banana, Avocado, and Flax Muffins. Make these healthy muffins ahead and freeze, then enjoy as you want during the week. Combine the flours, salt, and baking soda. Set aside. In a separate bowl, mash the bananas and avocado. Stir in the eggs, water, sugar, nuts, and flax. Add the dry ingredients and stir until just combined – don’t over do it! Divide batter between 12 muffin tins sprayed with cooking spray. Top each muffin with a sprinkling of rolled oats. Bake at 350 for 15-20 minutes or until toothpick inserted comes out clean. Yield: 12 muffins.